Just clickÂ to download it. For the 800k seller in north Scottsdale? Or the 250k seller in Avondale? The answers are very different. Buyers in the 800k range have many homes to choose from. Juxtapose that to Avondale which currently has the hottest seller market in the valley. Glendale is just behind Avondale -but still a red hot market for sellers. Hot seller markets are simply markets that have lots of buyers â€“ and too few sellers. It is always supply and demand. The sticking point is that supply and demand numbers are not universal to an area or price point. So when the news reports â€œitâ€™s a red hot sellerâ€™s marketâ€ take a moment and look at the valley as a series of sub-communities â€“ each with their own numbers. â€œMultiple offer situations are increasing. If buyers are wanting to spend more than $500,000 then they are in luck – supply is much more plentiful above that mark, though a few very popular areas like Arcadia have relatively slim pickings. 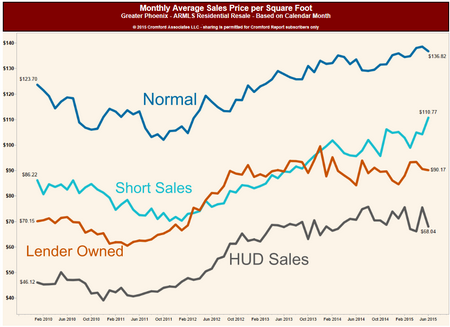 During May even those upper price ranges saw a downward trend in active listing counts, but not enough to cause any real problems for most buyers. If today’s normal demand can cause supply to drop as much as it did in the last month, then buyers are going to have an even harder time if demand were to grow. This is especially true for the entry level market which is desperately short of homes for sale or rent. The growing sense of justifiable optimism in the housing market tends to bring out ever more ridiculous articles in the media, usually forecasting doom and gloom ahead. Some even pretend to use mathematics to justify their case. Wondering if it a good time to sell for your price and neighborhood? Most likely the answer is yes. As always, the best answer is a researched answer. We simply need an address to give you a real answer to that question â€“ anytime.